Food is a big deal at our house. It’s our health plan and our insurance and our future. We feel very strongly that food is the foundation for all the body’s needs, and our kids deserve to eat real, whole, natural foods. Not from a box or a can or an aluminum tray, with all sorts of dubious substances added. It’s a very cool thing to hear our 2 year old ask “this organic food?”, or “this vegan?”. We eat a predominantly vegan diet – no meat, fish, fowl, dairy or eggs. We do use honey. The fundamentalist vegan would be right in arguing that some bees are killed through the regular maintenance and “harvesting” of the honey. Well, I figure that worms die every time we dig a carrot or potato out of our garden, and we probably inhale or step on many beings with each move we make. So what we try to do is minimize the suffering our food choices create, while eating a nutritious, energizing, diverse diet. Mix all dry ingredients, then mix in liquids, then add chocolate chips. Sure, you could make cookies on a baking sheet, but I just usually put it in a pie pan (no oiling necessary), put in the oven, and call it cookie pie. Bake until browned on the bottom, 15 – 20 minutes for cookies, and 25 or so for cookie pie. This is a vegan recipe, though you can’t tell a difference in the taste (omnivores eat them up just as fast). Honey can be substituted for the maple syrup if you wish, and you can add hemp seeds or walnuts or whatever you dig. I like to put in about 1/2 cup of peanut butter and reduce the oil to maybe a tablespoon or so. When you add dry ingredients, be sure to put a bit more water to compensate. These are so good you’ll hurt yourself by eating the whole thing. Not that that’s ever happened to me. If you want more great vegan propaganda for yourself or a friend, try the Vegan Freak Radio podcast. Some of the language is not for little ears, but it’s funny. Sounds great! I am hoping that the syrup will add a nice sweetness to it without making it too sickly. Making it tonight so I will let you know how it goes! I’m a vegetarian now for a little bit over a year and at the beginning I found it a bit difficult to find some great recipes. Your Chocolate Chip Cookie Pie Recipe looks great and I’m going to give it a try this weekend and I hope I can add another great recipe to my growing list. This is kind of a naive question, but what do you use for the chocolate chips that makes them vegan? I’ve been making a lot of vegan desserts just because I love sweets and needed to find ways to make them not as horrible for me. I am a big chocolate fan, and am assuming you’re not just using regular chocolate chips, but didn’t know if it was carob or something else? 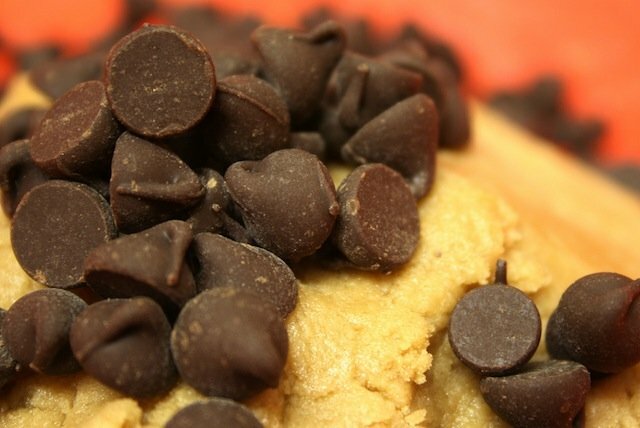 Sara – Pretty much all dark chocolate baking chips are vegan – there is no dairy added to them. However, there are quite a few milk chocolate chips for sale, which do have milk added to them. We buy ours from our local co-op, in the bulk section. Sometimes people think cocoa butter is a dairy ingredients because of the name, but it’s merely the fat from the cacao bean. Happy baking! Sara ~ We use raw chocolate which is called cacao. You can buy it in its whole bean form or in nibs. For cooking we us the nibs. If you have never had real orginal unprocessed chocolate you are in for a surprise. It is also consider a super food. I was just about to make these, but noticed there isn’t any baking powder/soda…is that correct? I’m anxious to make these for my family! Correct. Never used it for this recipe. If you do, let me know how it turns out. What temperature do you bake the pie at? I don’t see it in the instructions. 350 degrees – should be at the top of the recipe. I didn’t realize it was before the ingredient list. I was searching through the instructions after the ingredients. Thanks! Is the coconut necessary? I’m seeing if I can bake without running to store. Do you think agave would work instead of maple syrup? Coconut is optional, and I think it would work just fine with agave – though I don’t know what the ratio for conversion is (it may be 1:1).